The game of Battleship is thought to have its origins in the French game L'Attaque played during World War I, although parallels have also been drawn to E. I. Horseman's 1890 game Baslinda, and the game is said to have been played by Russian officers before World War I. The first commercial version of the game was Salvo, published in 1931 in the United States by the Starex company. Other versions of the game were printed in the 1930s and 1940s, including the Strathmore Company's Combat: The Battleship Game, Milton Bradley's Broadsides: A Game of Naval Strategy and Maurice L. Freedman's Warfare Naval Combat. Strategy Games Co produced a version called Wings which pictured planes flying over the Los Angeles Coliseum. All of these early editions of the game consisted of pre-printed pads of paper. In 1967 Milton Bradley introduced a version of the game that used plastic boards and pegs. The method of play involved using pegboards and miniaturized plastic ships, and was thought of by Ed Hutchins. In 1977, Milton Bradley also released a computerized Electronic Battleship, followed in 1989 by Electronic Talking Battleship. 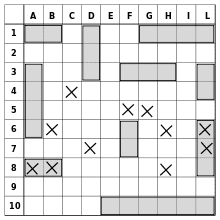 In 2008, an updated version of Battleship was released, using hexagonal tiles. In the updated version, each player's board contains several islands on which "captured man" figurines can be placed. Ships may be placed only around the islands, and only in the player's half of the board. When the movie "Battleship" was released, the board game reverted back to the original 1967 style. The 2008 updated version is still available as "Battleship" Islands". Battleship was one of the earliest games to be produced as a computer game, with a version being released for the Z80 Compucolor in 1979. Many computer editions of the game have been produced since. In Clubhouse Games for the Nintendo DS, Battleship is known as Grid Attack. It is played on an 8x8 grid, and includes slight variations, such as 4-player gameplay, various ship sizes and shapes, as well as the option to make the ships touch each other. Iterations of Battleship appear as applications on numerous social networking services. Battleship was also part of Hasbro Family Game Night for the PlayStation 2 and Wii, as well as the Xbox 360 (Xbox Live Arcade). 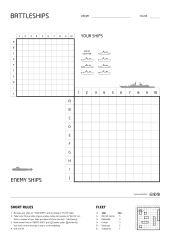 These alter the rules, including the size of the grid (8x12 in the NES version, 8x8 in the Game Boy version), size of ships (it is common to feature a submarine that takes up a single square) and special shot missiles for each ship (for example, in the NES version the cruiser has a 5-shot missile which strikes 5 squares in an X pattern on the grid in one turn. Submarine-tracking sonar and aerial reconnaissance to spot ships are also features). A minigame version of the game was used in the third season of The Hub's Family Game Night, which uses a 5x5 grid and the first team to sink three ships wins the game. The 2012 film Battleship is an American science fiction action movie inspired by the board game. The game is played on four grids, two for each player. The grids are typically square - usually 10x10 - and the individual squares in the grid are identified by letter and number. On one grid the player arranges ships and records the shots by the opponent. On the other grid the player records his/her own shots. One variant allows players to decline to announce that a ship has been sunk, requiring their opponent to take further shots in order to confirm that an area is clear. Another house rule allows a player to move one of their ships to a new, uncalled location every fourth or fifth move. Ship Attack is a development of the game that stresses analytical thought over (relatively) blind guessing. The players use intelligence collecting tools in order to pinpoint the location of each and every vessels in the enemy fleet. A reconnaissance airplane reports sequences of ship parts in a row or column, a satellite image can be taken to count ship parts on a 3x3 square, and a paratrooper can determine if one tile is populated by a ship part or sea. This variation can be played with the same board drawing on the pen and pencil version. Ship Attack rules are a platform to Bimaru-style puzzles, in which one is presented with a minimal intelligence report required to decipher an entire board. The Japanese variation of the game differs in several key aspects. It uses a 5x5 grid, on which each ship takes up one space. Each player has 3 ships, distinguished only by the number of hits they can sustain before sinking. Ships may move in orthogonal directions in lieu of firing, but the type of ship, distance, and direction of the move must be announced to one's opponent. Ships may only fire on neighbouring squares, including diagonals, but a near-miss (when a square next to one's own ship is hit) must be declared as such. Regional variations include rules for multiple shots, limited ammunition, no consecutive moves, and friendly fire, among others. With the increasing popularity of the international version of the game, the Japanese version has apparently lapsed into comparative obscurity even in its native country. The customary Russian version known as Морской Бой ("Sea Battle") is comparatively simple and is mostly pen-and-paper. It is almost always played on a 10x10 grid (with Cyrillic lettering, with letters «й» and «ё» normally omitted). Depending on the rules, a player may or may not take another shot on the same turn if an enemy ship is hit. Ships cannot occupy squares next to each other, horizontally, vertically or diagonally. Also, the set of ships is noticeably different (see table below). The alternate designations are based on dated distinctions of ship classes, namely the number of gun decks for Age of Sail and number of funnels for earlier steam-powered ships. Note the matching size and number of decks/funnels. The Slovenian version from 2001 takes the game into 3D space, yet it maintains the pen&paper simple format. The 3D grid is 5x5x5 space and each ship must be placed with the three coordinates. No diagonal placing is allowed. The game was developed by Blaž Branc and Matej Avsenak.